A selection of tales from Ted Hughes’s Tales From Ovid. The blind folly of man forces divine transformation. Come witness the spirit world as seen through the eyes of the blind prophet. This epic by former British Poet Laureate Ted Hughes features thrilling stories of literal human transformation, dramatic acts of violence, and very angry Gods. 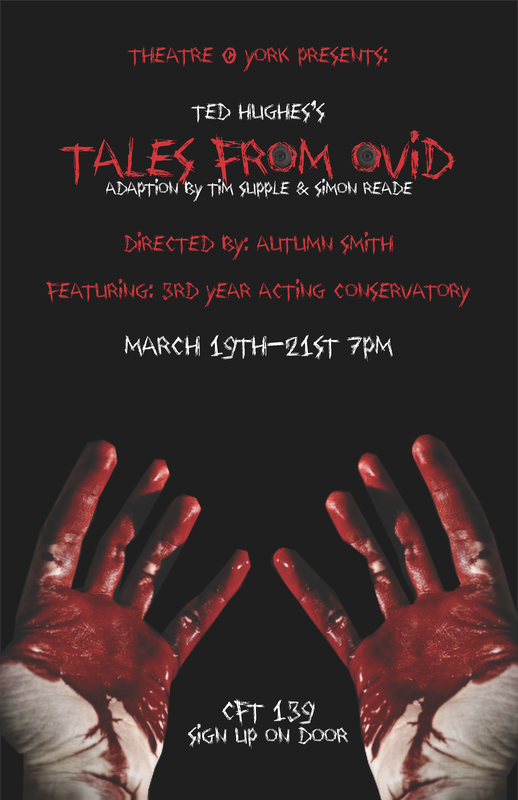 Directed by Autumn Smith with the 3rd year Acting Conservatory in a play that defies all expectations. Sign up on the door of CFT 139. Performances from March 19th-21st at 7pm. Free. Tales from Ovid is a poetical work written by the English poet Ted Hughes (17 August 1930 – 28 October 1998). Published in 1997 by Faber and Faber, it is a retelling of twenty-four tales from Ovid’s Metamorphoses. It won the Whitbread Book Of The Year Award for 1997 and has been translated into several languages. It was one of his last published works along with Birthday Letters. Four of the tales were previously published inAfter Ovid, New Metamorphosis, edited by M. Hofmann and J. Ladun. A stage adaptation was performed by the Royal Shakespeare Company in the autumn of 1999 at the Swan Theatre in Stratford-upon-Avon. TheQueensland Shakespeare Ensemble has also performed dramatisations of excerpts from Hughes’ book, between 2006 and 2008. In 2009, Fiona Shaw performed one of these tales, Echo and Narcissus, in the context of a Prologue to Henry Purcell’s Dido and Aeneas, directed by French conductor and harpsichordist William Christie. “In transforming Ovid, Hughes follows a well-traveled path. Even as Ovid himself pillaged Greek and Roman mythologies in composing his Metamorphoses Chaucer, Milton, Dryden and especially Shakespeare (in whom, one contemporary noted, the sweet witty soul of Ovid lives) ransacked Ovid’s stories to furnish their own artistic worlds. Hughes makes clear his admiration for the gift that Shakespeare shares with Ovid: insight into what a passion feels like to one possessed by it. Not just ordinary passion either, but human passion in extremis — passion where it combusts, or levitates, or mutates into an experience of the supernatural.